Here at Unique Magazines we have teamed up with DC Thomson, the publishers of Beano and Jacqueline Wilson Mag, to create the ultimate prize giveaway! The prize includes 2 sessions, each lasting a minimum of two and a half hours, for a class of 30 (maximum) children aged 7/8 with a professional Beano artist. The artist will demonstrate how to create characters and draw comic strips. By the end of the sessions, participants will have produced a finished comic book, with a comic strip from each child, complete with individual caricatures! Simply subscribe or renew your subscription for your school to Beano or The Official Jacqueline Wilson Mag before Friday 29th September 2017* to be entered into the prize draw to win a visit from our Beano comic artist! Beano is a humour-based weekly strip comic aimed at kids aged 7 – 11. Despite all the mischief, the Beano retains a high level of parent and guardian approval due to the supported reading experience comic strips can provide. This is particularly relevant amongst boys, who can be reluctant readers. 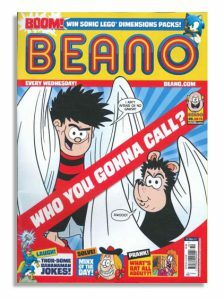 Click here to order your subscription to Beano magazine today. 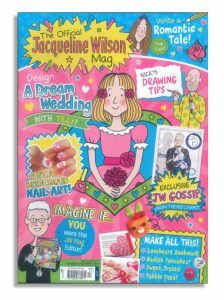 The official Jacqueline Wilson Mag is for girls aged 7 – 12 and encourages readers to learn, create and achieve through an inspirational writer. Educational content is packaged in enjoyable, accessible formats encouraging literacy by fuelling imaginations and inspiring creativity! Click here to order your subscription to Jacqueline Wilson magazine today. * Competition closes 29/09/2017. One winner will be selected at random from all applicants. UK and ROI entrants only. The winning school will win a day with two sessions from the artist. Winner’s details will be forwarded to the publisher DC Thomson & Co. Ltd. to arrange the prize. More details provided following winner being contacted to secure a date for the event. More importantly, Unique Magazines have experience with working with schools, we understand the importance of raising invoices for your records and to be able to offer multiple paying methods to make it easier for you. For more information on subscriptions for schools please click here or contact us on 0345 303 6750.